For the month of May, our Partner of the Month is DataFeedWatch. Our team interviewed their VP of Marketing, Monica Axinte, to help 3dcart merchants get insight into their company and solution. 1. Please provide some general background and history on your company. DataFeedWatch was launched in 2013. At that time, we had built another tool that was managing Product Listing Ads on Google Shopping. It became clear while managing PLAs that we were leaving a lot of money on the table. Optimizing data feeds is the primary key to success and profitability on Google Shopping. So, we started looking for tools that would help us manage and optimize our own feeds and our clients feeds. We discovered that there was no affordable solution for small and medium sized advertisers. DataFeedWatch was developed out of necessity. We built something that we needed ourselves: an application that would help us manage and optimize feeds to build profitable campaigns in Google. We were happy with the solution, so we started introducing it to our partners. The feedback we received encouraged us to work on developing it further. One thing led to another. Today, we are one of the leading feed optimization and management tools on the market. We now offer more than 1,000 shopping channels in 50 countries to over 5,000 merchants. 2. What’s the main service your company offers? Our tool enables merchants to manage and optimize their feeds for more than 1,000 channels in 50 countries. Full functionality at an affordable price is what we offer to our customers. We offer basic mapping, categorization, hourly downloads, variant-management, creating filters, and uploading lists with products. We have a complete feed management service that merchants can use without having to spend half their budget on a tool. 3. Describe the integration and how long you’ve been a partner with 3dcart. We have been a partner with 3dcart for 4 years and have worked with dozens of merchants. 4. What are the benefits for 3dcart merchants that use your solution? DataFeedWatch does all the heavy lifting for 3dcart merchants. Our tool connects to the available product data in 3dcart. Then, we download the updated product data every day and we upload it to the merchants shopping channels within minutes. Flexibility – Merchants can create and optimize data feeds for partners in just a few minutes. This allows them to quickly test out new channels and have a better chance of reaching their customers where they are. Increase campaign ROI - with the analytics module, merchants can see detailed cost and revenue data for individual products on every channel. Full functionality – We offer simple rules to improve your titles, add missing fields, and expert level optimizations with regular expressions and custom labels for gross margin. 5. What are your solutions’ biggest strengths? Our tool is built in such a way that everyone, no matter what the feed management expertise level is, can use it. Our ease of use allows 95% of our customers to create their first feed with no help and within minutes. It offers all functionalities that merchants need at an affordable cost. 6. How does your solution compare to similar solutions in the market? DataFeedWatch is among the few tools that offer “full functionality”. more affordable - there is no minimum fee and you only pay for the services that you use. 7. What plans do you have for future development of your solution? We have recently launched the new DataFeedWatch generation, which is faster, more intuitive and offers even more functionality to merchants. DataFeedWatch Analytics with Cost Data Beta. It will be released to all our clients. This will allow merchants to get detailed performance data for every product on every channel and take immediate action on poor performers. Order management to sync inventories and orders between 3dcart stores and marketplaces like Amazon and eBay. More rules for product variants. 8. Any other thoughts for our readers, who are mainly e-commerce merchants? The product feed is the foundation on which every successful shopping campaign is built. The accuracy of your data feed is what will determine the ad relevancy for customer searches. Stay at the forefront of online selling and prioritize the optimization of your product advertising campaigns. 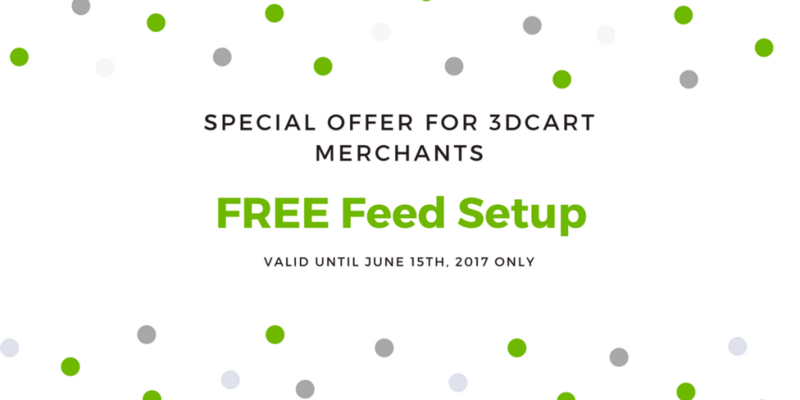 DataFeedWatch has a special offer for all 3dcart merchants that subscribe before June 15th. Click below to find out more.